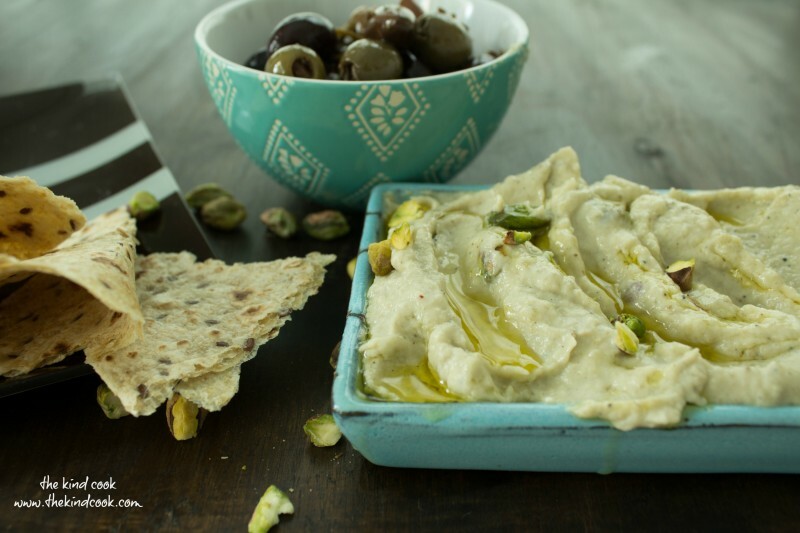 Baba ganoush is one of the many vegan dips you make and it’s so versatile. Enjoy it with vegetable sticks, on pizzas, in wraps or include it as part of a mezze plate for parties and BBQ’s. I like mine rich, smokey, creamy and well seasoned with loads of olive oil drizzled on top, waiting to be mopped up with warm flat bread. Place the eggplants on your stove top, on a medium to high flame. Turn them as they start to wrinkle. Cook until all sides start to char and they feel soft, (approximately 20 minutes). While they are cooking, put the garlic into a small pan with a little water (about ¼ cup). Simmer gently for about 5 minutes. Discard any left over water. # This is an important step as it eliminates that harsh astringent taste of raw garlic. Cut the cooked eggplants in half. If there are still any firm bits of flesh, put them back on the flame, skin side on the flame, until they are cooked. Then remove and discard the woody tops. Scoop the flesh out with a spoon and discard the skin. Blend the eggplant flesh and the remaining ingredients (except for the garnishes) in a blender or food processor, until they are well smooth and creamy. Check the seasoning and serve with a sprinkle of olive oil and pistachios. Time: 5 – 10 minutes preparation. 20 minutes cooking time. Yields: Approximately 1.5 cups of dip. Amount will vary depending on the size of the eggplants used. Notes: If you don’t have a gas stove top or don’t feel confident cooking the eggplant over a flame, cook it in the oven. This will take 40 plus minutes. The eggplant will not have the same smoked flavour, but you can add a little liquid smoke. Liquid smoke is found at well stocked delis, specialty supermarkets and online. This is best served straight away or at room temperature not long after you have made it.. Sometimes once refrigerated, it can split. But if you do make it the day before or have left overs and refrigerate it, simply blend it again before serving. Lashings of feta on freshly baked French stick is one of those things I really missed when I became vegan, but not anymore. I have played with this a number of times, replacing vinegar for the lemon juice, using part lemon juice and part vinegar for the acidity, using varying amounts of oil and salt, baking it and so forth but finally found the balance of flavours, texture and shape I was looking for. And for me feta is perfect when marinated. Olive oil, garlic and rosemary are a gastronomic match made in heaven. 1-2 large cloves of fresh garlic peeled and minced. Simply blend all the feta ingredients together in a high powered food blender or food processor, for a few minutes until they are smooth. This takes about 5 minutes. Then place the mixture into a nut bag. Place your hands at the top of the nut bag, above the mixture, squeeze it tightly and secure it with an elastic band. Place the nut bag into a colander and place the colander over a bowl so that any excess liquid can drain into the bowl. Refrigerate overnight. The next day carefully remove the feta from the nut bag. Discard the draining water. 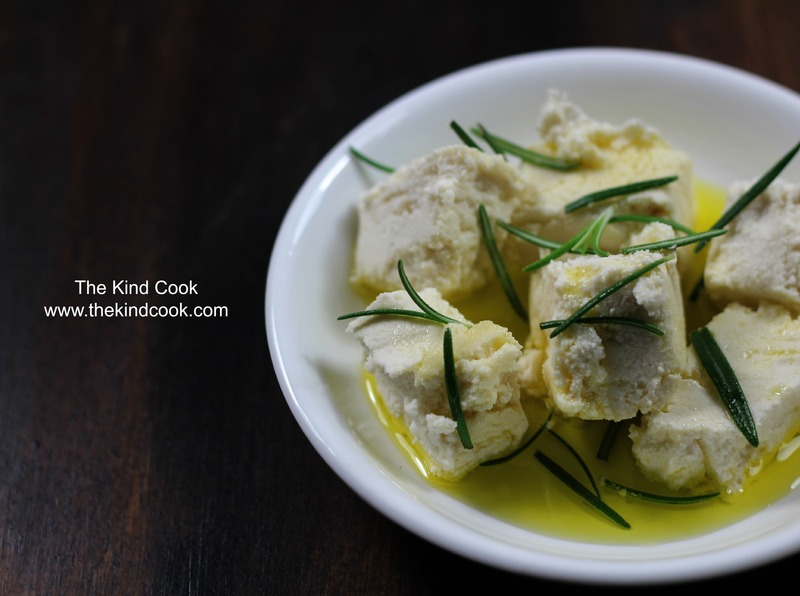 Put the feta into a small square container. Press it down so that it takes on the square shape and place it back into the fridge. Make the marinade by mixing all the marinade ingredients really well. Pour it into a shallow container. Carefully turn the feta out onto a chopping board and cut it into small squares. It is super soft like Perisian feta so breaks easily. Place the squares into the marinade and serve. I love serving it with marinated olives, roasted nuts and fresh crusty bread. Time: 10 minutes, plus the draining time over night. 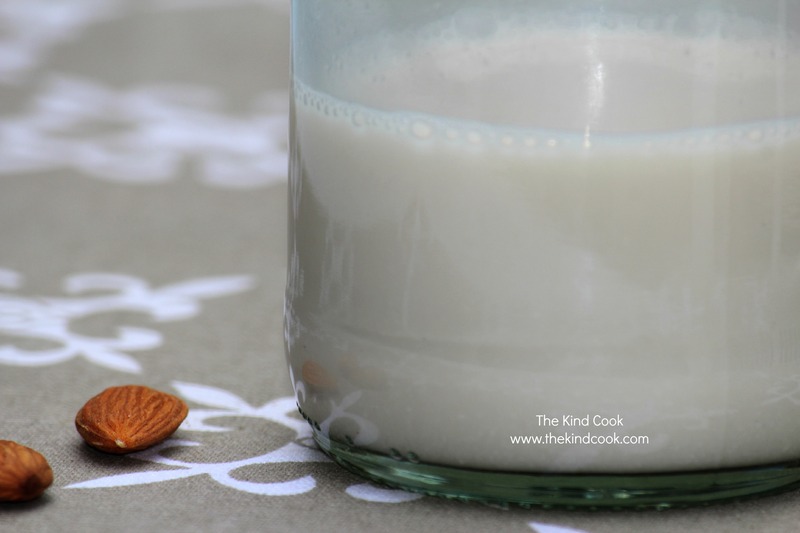 Notes: You can soak the almonds for a few hours before you blend them to soften them too, if you like. If you don’t have a nut bag (which I didn’t until recently) just line a colander with a clean chux, place the feta mixture into the middle of the chux. Bring the sides of the chux up around the mixture and tie it firmly with an elastic band. Place the colander over a bowl and also place it into the fridge to drain over night. I like to serve it the same day I make it, only because once refrigerated the marinade turns solid because of the olive oil. Wash the potatoes, spike them with a fork and microwave them till they are tender. Once they are cooked, cut them in half and carefully scoop the flesh out. Place the flesh into a bowl and discard the skins. Add the cumin, cardamom, coriander and salt to the potato and roughly mash everything together with a fork. Check the seasoning and form the mash into koftas. Put the flour on a small plate and the milk into a small dish. Mix the crushed almonds with the sesame seeds. Very gently roll one of the balls through the flour. Then sit it on a fork and dip it in the milk. Carefully roll it in the nuts, until it is well covered and place onto a small oven tray. # I tend to use one hand for the flour and milk and one for rolling them in the nuts, so that the nuts don’t get too wet. Repeat until all the koftas are coated. Place them in a preheated oven (180c). Bake for 20-30 minutes or until they are browned. Serve them hot, accompanied with relish, coconut yoghurt and a squeeze of lemon juice. Yields: 12 koftas. Will vary slightly depending on the size of the potatoes you used. Time: 15-20 minutes of preparation. 30 – 35 minutes cooking time. This will vary depending on the strength/type of your microwave and oven. Notes: Don’t worry if they weigh a little more or less than 450 grams. This will not make a huge difference. If you don’t wish to microwave the potatoes, you can bake them. This will take about 40 minutes though. The smaller the crushed nuts are, the easier they will stick to the koftas. You want them to have some crunch once cooked though, so leave them with a bit of texture still. I crush the almonds in a mortar and pestle, a few at a time. Soak the 1 cup of cashews and the ¼ cup of cashews over night, in separate containers with enough water to cover them. Once soaked, drain the water from the 1 cup of cashews and discard the water. Preheat your oven to 200c and make the cashew cheese by placing all the popper ingredients (except the jalapeños), into a blender and blending for 5 minutes. Make sure you scrape any lumps from the side of the blender and add them to your mixture so that they blend nicely too. Once the cashew cheese is smooth, set it aside. Slice each jalapeño in half. Remove and discard the seeds. Put a generous teaspoon of the cashew cheese mixture into each jalapeño half and set aside. 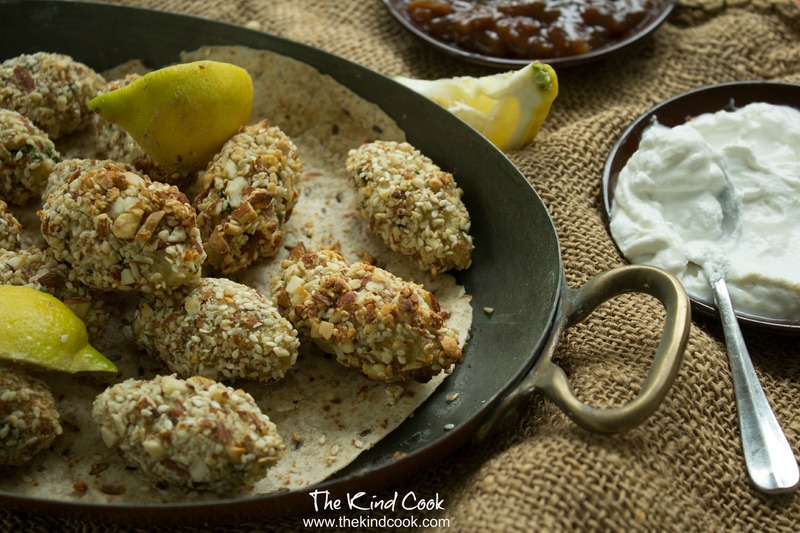 To make the crumbing mixture, combine the bread crumbs and nutritional yeast and place them onto a plate. Pour the milk into a small shallow bowl. Carefully dip the stuffed poppers into the almond milk. Place them onto the breadcrumb plate and cover them generously with crumbs. Shake off any excess crumbs. Repeat until each popper is well covered. The bottom half will only have a thin layer of breadcrumbs, but the cheese stuffed top will have a nice thick layer. Place the poppers onto a dry baking tray and into the oven. Cook for 15 minutes until the jalapeños have softened and the bread crumbs have browned. While the poppers are cooking, make the sauce. Drain the remaining 1/3 cup of cashews and discard the water. Blend the cashews with the rest of the sauce ingredients, for 5 minutes until smooth. Place the sauce into a serving dish. 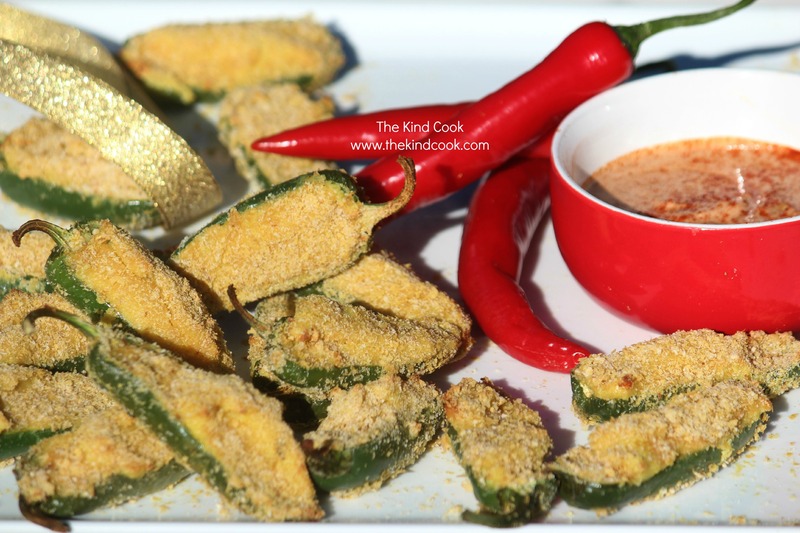 Once the poppers are cooked, place them onto a platter, with the sauce and serve immediately. Time: 30 minutes to prepare and 15 minutes to cook. Plus the soaking time for the cashews. 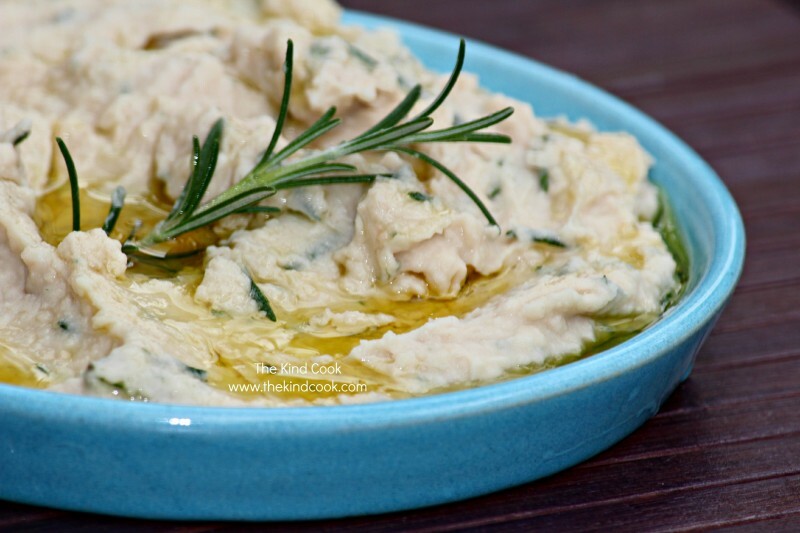 This is so so easy and the result is rich, creamy, fragrant gorgeous dip. It’s perfect for a kids snack with vegetable sticks or at a party or BBQ. Blend all the ingredients except for the extra tablespoon of rosemary leaves. Once the ingredients are all well blended and smooth, stir the extra rosemary through the mixture and serve. If you wish you can pour a little extra olive oil over the top when you serve it. Note: I made this using raw garlic and the garlic was too sharp on your tongue. I just popped a bulb of garlic in the oven on a low to medium temperature – about 150c with oil and cooked it until it was soft and well coloured. I then added 2 cloves to this and the result was so much better. Roasting the garlic takes that raw harshness away and you end up with a lovely sweet result. Put the almonds in a bowl and enough water to cover them. Pop in the fridge and leave them to soak overnight. Discard the soaking water and rinse the almonds. Place the nuts, the 1 cup of water and the 2 medjool dates in a blender and blend well for a few minutes. Pour the milk into a nut bag a strain out all the milk. Put the almond roughage aside. #See notes. Chill the milk and serve over cereal, make a smoothie, flavour it with cacao or use however you would like. If you don’t have a nut bag, you can use a chux or cheesecloth. Don’t discard the almond roughage. You can make simple and delicious raw almond chocolates with it. I must post that recipe one day! If you are not using it straight away, use it within a few days. Remember to also give it a stir before using, because it will separate. Guacamole is so versatile. I use it as a sandwich spread, on nachos, on pizza, as a dip, with falafel, on baked potatoes and it goes beautifully with my Mexican Rice and Bean Soup. 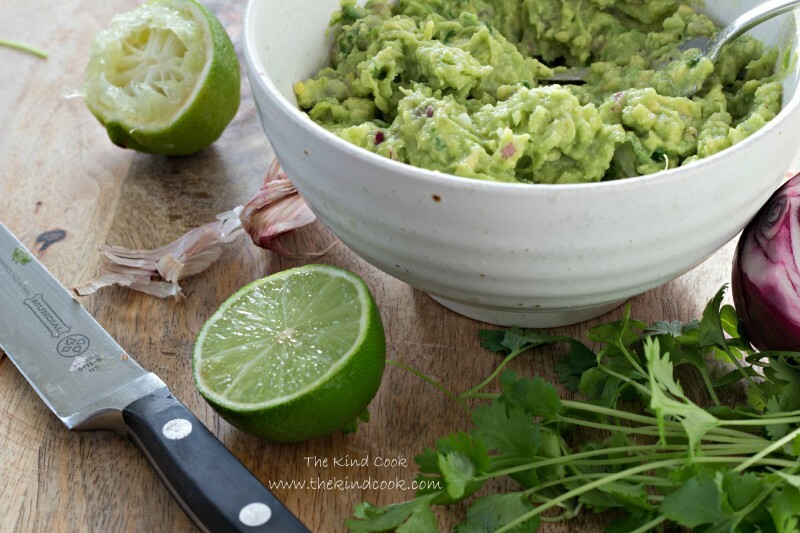 I like mine chunky, with loads of garlic, fresh lime juice & plenty of fresh coriander. Just use my measurements as a guide and adjust for your own flavour preferences. Peel the avocado and remove the core. Discard the skin and core. Place the avocado into a bowl and smash it roughly with the back of a fork. Add the garlic, juice and salt and mix to combine. Finley slice the coriander roots and roughly chop the leaves. Add the coriander and red onion to the bowl. Mix all the ingredients. Check and adjust the seasoning if required. Yields: Approximately 1.5 cups. Will depend on the size of your avocados. 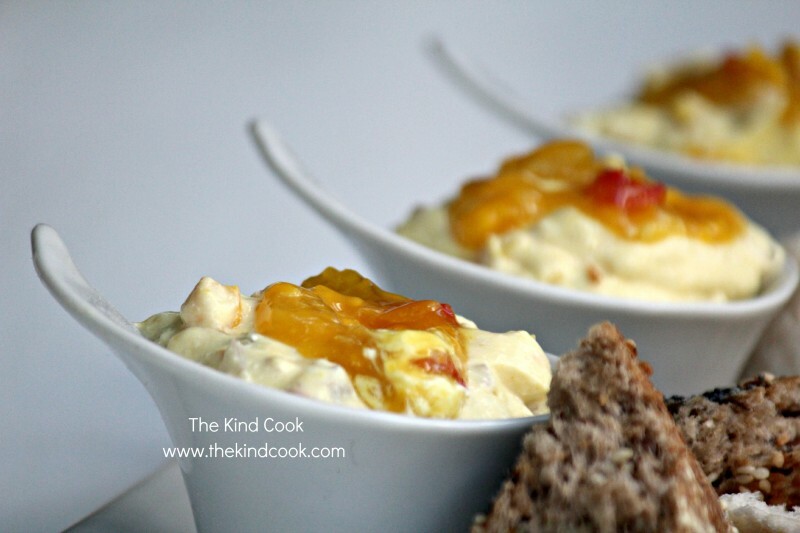 Another super simple but always popular recipe. It’s great for an afternoon tea, for something easy, but a little bit fancy pants. Wash & dry the cucumber. Cut it into sections that are the same length as the bread. Then cut those sections into very thin slices. 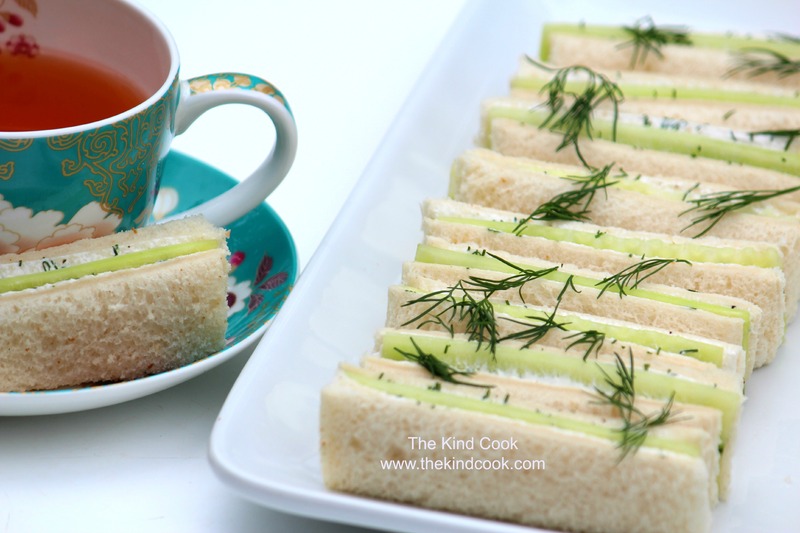 You need enough slices to have one layer of cucumber for each sandwich. Probably 2 slices per sandwich will be enough, depending on the width of the slices. Lay the cucumber slices onto draining paper and set aside while you prepare everything else. Put any leftover cucumber aside for another recipe. Trim the crusts from the bread and set them aside for another recipe. Lay 2 slices of bread onto your bench and liberally spread them with the cream cheese mixture. Place 1 layer of cucumber onto 1 of the slices, until all the cream cheese is covered and put the 2nd slice of bread on top, with the cream cheese facing down onto the cucumber. Cut the sandwich into 3 even rectangle finger sandwiches and put them on a plate. Repeat until all your finger sandwiches are made and serve. If you are not serving straight away, cover the sandwiches with cling film and refrigerate. Use in the same day though. Notes: Giving the cucumber time to sit on some draining paper is a really important step because otherwise you will end up with very soggy sandwiches. You can get dairy free cream cheese in the supermarket, where the dairy cream cheese is. Enjoy this as is or use it as a base and add anything else you wish. Finely sliced red or green chillies or lots of fresh chopped coriander would compliment this beautifully. I just wanted something super quick and simple when I made this one. Set aside a couple of spoonful’s of corn relish to use for garnish. Put the rest of the corn relish and the ingredients in a bowl, stir to combine and serve. Serve topped with the few spoonful’s of corn relish that you had set aside. Accompany with plain corn chips or flat bread. Serves: Makes 1.5 cups of dip.